Optical coherence tomography (OCT) is a low-coherence interferometry based bio-imaging technology. It has attracted extensive research interests in recent years for its non-invasive, high-speed and high-resolution properties. Numerous schemes for improving OCT resolutions have been demonstrated in literature. 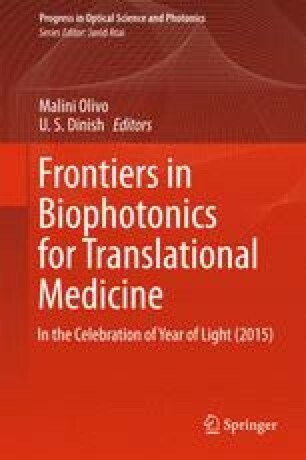 This chapter gives a comprehensive review of the recent developments of spectral domain (SD)-OCT systems with either high axial-resolution or lateral resolution, and then highlights the wide applications of such high-resolution OCT systems in biomedical imaging process. The influences of high-resolution OCT systems towards translational medicine are also discussed. Jianhua Mo is supported in part by Soochow University, China (Startup grant: Jianhua Mo) and Natural Science Foundation of Jiangsu Province (SBK2014043010). Linbo Liu is supported in part by the Nanyang Technological University (Startup grant: Linbo Liu), National Research Foundation Singapore (NRF2013NRF-POC001-021), National Medical Research Council Singapore (NMRC/CBRG/0036/2013), Ministry of Education Singapore (MOE2013-T2-2-107).